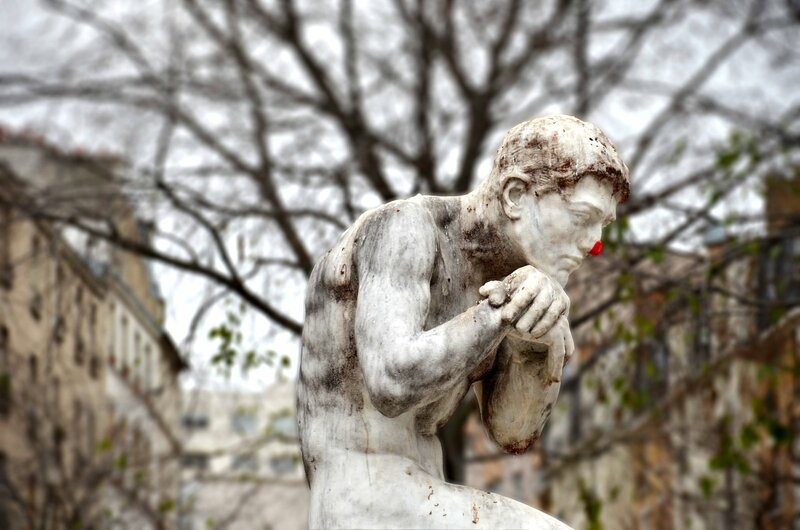 ParisDailyPhoto: Red nose not to feel blue! Sometimes even the most cheerful people feel a little down. I going through that phase at the moment and when I saw this statue in front of La Maison des métallos, it made me think of me! The red nose "they" put on this statue probably comes from Hors-piste, an event that involves comedians from Le Rire Médecin, an association that sends clowns to hospitals to entertain sick kids. Maybe I should do this! I know the Brits have a Red Nose Day and that was who I thought was doing it around Paris! Funny how your mood prompted the picture. Watch a little Modern Family to perk you up, and a piece of chocolate cake! Cheers to you! Thank you for PDP, a site which cheers me every day. Hope the blue period passes quickly. I love it! Very appropriate for the season. (I can't remember if Rudolf is famous in France?). Whoever "decorated" the statue has a good sense of humor. Your sweet Omaha lurker, Annette, spoke my sentiments. You cheer me daily, Eric! But you're allowed to have a down day, as are we all. I hope you feel happy soon. Nothing like a bright red nose to cheer the low in spirit! Kalimera (bonjour) from a sunny but cold Athens. I hope to find your smile and your positive mood soon! You have so many friends worldwide thinking of you that I am sure that this phase will pass soon! Sorry to hear you're not feeling so chipper today, Eric. I like Phx's prescription... As for your photo, it certainly gave me a chuckle. This is a beautiful photo, Eric. This is a bit of a portrait and a self portrait. You'd be remarkable to serve the sick children and they would render to you, at least twice. Now I can not wish you to stay in this passing mood, unless it is beneficial. You already had the cheerful consolation of the previous comments and you will certainly be better. In any case, I like the expression of the photo. The art of photography is to capture or create a mood. You always excel in this field. The hands of the statue are suspended in a vacuum. Do they normally rely on a cane? I agree, there is little of Chaplin here. Have a very nice day, Eric. i was part of a celebration on monday night during which i wore, for several photographs, along with fellow honorees, a red nose. shall i send mine to you? it was used only for a minute or so. hope the light penetrates through the gloom for you soon, eric. What a wonderful group. I"m sure it puts smiles on the children's faces. I think this sad fellow is feeling happier with his new rouge nez. I've just realised that I used the term 'Hors-piste' in the pub last Friday night. They gave me a bad beer and I told them it tasted like a horse pisssed in it. However, in the best British tradition, the landlord was very polite about it. He wished me "Good Night Sir" as he threw me through the window. So cheer up Eric, it could be worse. Maybe it's the holidays (so much pressure to be cheery! ), maybe it's so few hours of daylight. This too shall pass, mon ami—meanwhile, your post shows that you still have your sense of humor. Thanks everyone,for your nice words and funny stories (Drummond). I wish I could say I'em feeling better, but not really. Besides I have big computer problems and this drives me crazy. But it could be much worse, I could sleep in the cold streets like the people we see on TV at the moment. Eric, I love your clever title, especially! I enjoy your posts very much, and agree with the others. It happens to most everyone, now and again. Hope you are soon back to your happiest self. 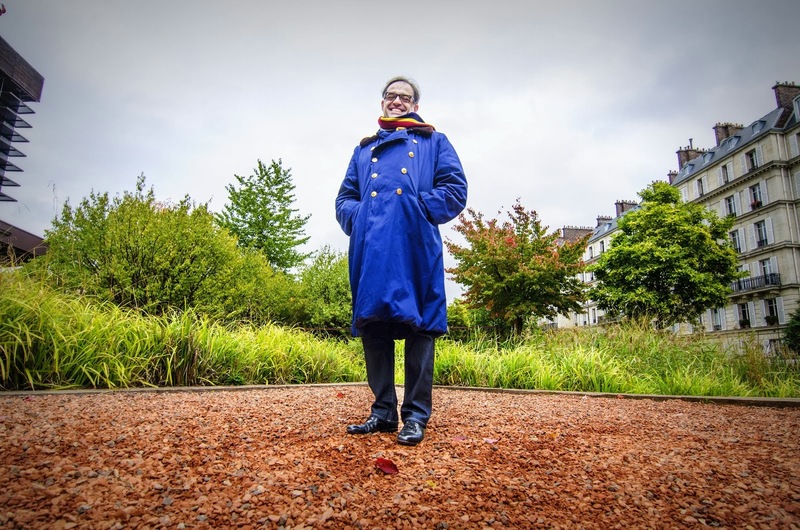 I love your story, Drummond ! !